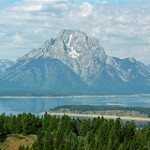 Mount Moran and Jackson Lake: Grand Teton National Park, September 2003 Mount Moran rises above Jackson Lake. Taken from atop Signal Mountain. This entry was posted on March 31, 2008 at 1:14 pm.